The Cayman Islands arguably offer some of the best diving in all of the Caribbean. Whether you are looking for the perfect spot for some lessons, to explore shipwrecks, or to see sea life, you will find it here. With vibrant reefs and plenty of dive sites, diving in the Cayman Islands should definitely be on your list of things to do during your stay at The Residences Seven Mile Beach in Grand Cayman. Access our complimentary Vacation Guide to get the inside scoop on planning your getaway! 1.1 When Should I Go Diving in the Cayman Islands? 1.2 What Will I See? When Should I Go Diving in the Cayman Islands? Diving is a great activity to enjoy during all times of the year! We experience warm weather year round, so you’ll never be chilly. Plus, the water temperature ranges from about 78-82°F, so it’s always comfortable! However, June to November can get stormy, so you have to watch out for the weather. There is a whole underwater world for you to explore when you vacation on the Cayman Islands! Marine life is plentiful; you’ll be swimming with countless sea creatures such as silversides, sea turtles, seahorses, and more. Coral reef diving is incredibly popular here, and the beauty of the colorful formations is a must-see. The swaying plants that have adhered to the coral are teeming with fish and other fascinating underwater creatures. The Devil’s Grotto has become a top dive site for both locals and visitors alike. It is an amazing shore diving spot, and the Eden Rock Dive Center is right next to it so you can easily rent gear. This site is full of natural caves, caverns, and tunnels; the light shining through from the surface is eerie yet breathtaking. 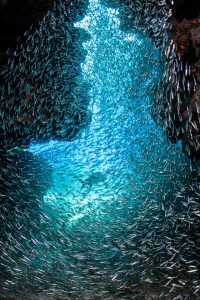 Plus, silversides are known to create a glittering show right before your eyes from June to early August. The USS Kittiwake was originally launched in 1945 before retiring in 1994. In 2011, it was deliberately sunk right at Seven Mile Beach! Now, you can scuba and snorkel around the wreck. The spacious ship has blended right in with the marine life below, so you’ll get to see tons of creatures as you explore. Have you ever dreamed of swimming with stingrays? You can at Stingray City in Grand Cayman! This incredible attraction puts you right in the water with these magnificent creatures. The water is shallow so scuba gear isn’t really necessary, but it’s a great way to prepare yourself for diving with the rays in other spots. Many dive operators will take you here if you ask! When you dive at Ghost Mountain, you’ll see why it got its name. The water here is cloudier than normal due to the rich nutrients from the north sound, but still clear enough to see. As you make your way through the water, the slopes of the mountain begin to appear. Sponges have attached themselves to the surface and schools of colorful fish constantly swim by! If you have never gone diving in the Cayman Islands, are a beginner, or need a refresher, we recommend starting with a spot like the Eden Rock Dive Center. Not only is this shore diving location surrounded by gorgeous coral reefs, they have rental gear and lessons available. Cayman Turtle Divers– Cayman Turtle Divers offers both instruction and dive trips throughout the islands. Whether you are looking to see some coral reefs or meet wildlife, they can help you do it! Deep Blue Divers Grand Cayman– Not only does this company offer fantastic dives, they can also assist you in getting your scuba diver certification. Imagine leaving your vacation at The Residences Seven Mile Beach in Grand Cayman with a certification! Living The Dream Divers– This dive company offers a wide range of services from group excursions to night dives. They even have packages available so you can enjoy multiple days of diving in the Cayman Islands! Indigo Divers Grand Cayman– The best part about Indigo Divers Grand Cayman is that there is always an absolute maximum of six divers on each excursion. This means that your boat and dive will never be crowded! You can be assured you will always get plenty of expert instruction and guidance. 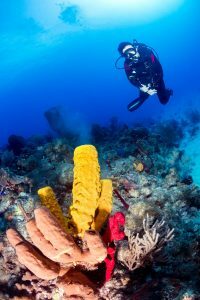 Off the Wall Divers Grand Cayman– This company was one of the first small dive operators to begin to offer tours around the reefs of the island. Now, they remain one of the best! They even offer Diver Propulsion Vehicles (DPV) to make your trip even more fun and unique. When diving in the Cayman Islands, you’ll have two choices: off a boat or off the shore. There are pros and cons to both! If you’d like to go scuba diving off a boat, you will need to hire a dive operator like one of the ones mentioned above. If you have any questions or concerns about which to choose, your concierge at The Residences Seven Mile Beach in Grand Cayman will be more than happy to help! Another great option is shore diving. With so many reefs right near the shore, there is no reason to take a boat! Certain shore sites like Devil’s Grotto are some of the most popular spots for diving in the Cayman Islands, so they are not to be missed. Whether you consider yourself an expert diver or have always wanted to learn, the Cayman Islands are an underwater paradise. Spend your vacation relaxing on the sand and exploring the beauty under the surface! Stay with us at The Residences Seven Mile Beach in Grand Cayman; we have the finest suites and amenities waiting to accommodate your every need. We know that choosing a place to stay is one of the most important parts of a getaway, and our luxury condos will not disappoint. You’ll love coming back to your condo complete with spacious lanais, intimate balconies, and luxury baths after your day of diving in the Cayman Islands. Book your stay today; we look forward to seeing you!